George Clooney, Amal Alamuddin Adopt! Awwww! This is so cute! I love hearing happy stories about rescue pets being adopted. Especially when it’s people who can afford to buy an expensive pedigree dog and rather choose to save a life. Congrats to the Clooney family! Found a home for this hound! George Clooney and his wife, Amal Alamuddin, adopted a sweet shelter dog named Millie on Wednesday, Oct. 28. The happy couple stopped by the San Gabriel Valley Humane Society in San Gabriel, Calif., where Millie — a short-legged, long-eared basset hound with googly eyes — adorably awaited their love. "It was a happy day at the shelter for Millie!" the shelter wrote on its website on Wednesday. "She is a four-year-old Basset Hound mix with gorgeous looks that would land her on any 'Hush Puppies' commercial!" According to the website, Milie was homeless up until several weeks ago. "Millie was found without a home and hoping for food scraps outside of a local restaurant in San Gabriel earlier this month," the post revealed. "Today her luck changed for the better when she was adopted by George and Amal Clooney." The Clooneys, meanwhile, were already in search for a basset hound like Millie, whose photo they came actress on pet search-engine Petfinder. On Wednesday, they brought along their adopted cocker spaniel Louie to meet Millie, and potentially see if they could get along. "They did a ‘meet and greet’ with her and spent time introducing her to their other rescue," the site shared. "It was good news that Millie and Louie hit it off and the happy, new family headed home together! We hope Millie will stay in touch and send photos. 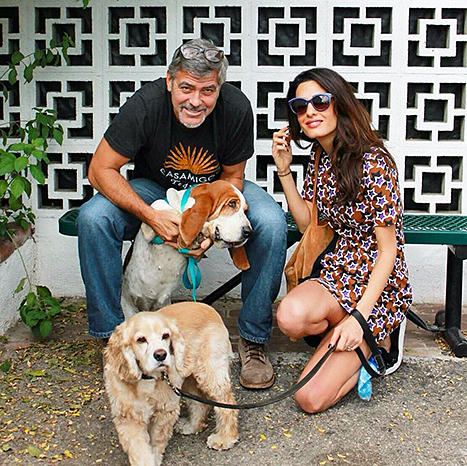 Congratulations to the Clooney family and thank you for adopting!" Free Doughnut at Krispy Kreme - Today Only! 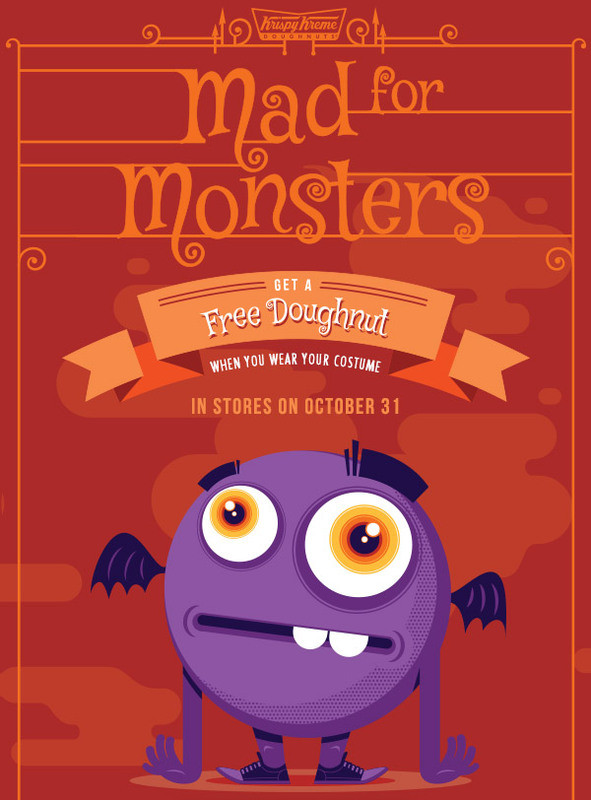 Check out this awesome opportunity for your chance to snag a free doughnut! Show up in your costume at your local Krispy Kreme location and receive a Halloween treat – a delicious, free doughnut! 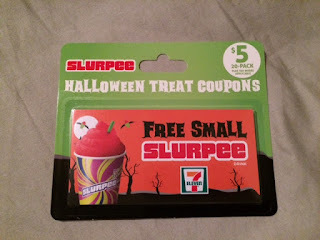 Not a slurpee person, but want to get in on this awesome voucher idea? 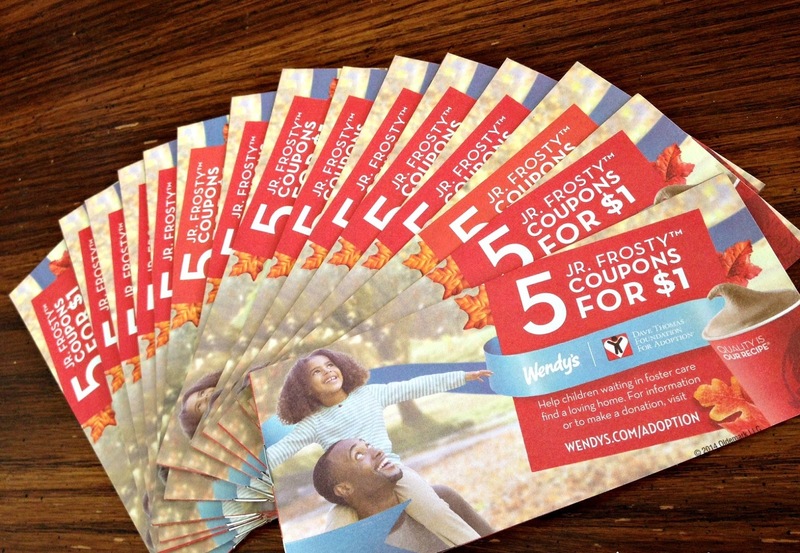 Wendy’s is also offering an exciting coupon book for Jr. Frosty’s. 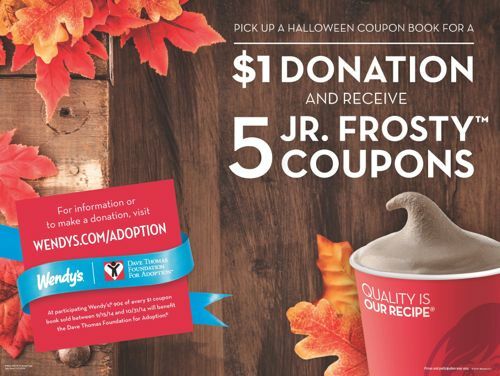 For only $1.00 you can purchase a coupon book for 5 free Jr. Frosty’s! 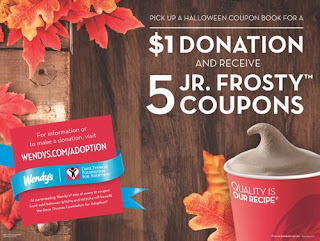 Not only is this a wonderful deal, 85 cents of every $1.00 coupon book sold is donated to the Dave Thomas Foundation for Adoption. I totally love being able to buy something I want and it having a dual purpose of benefiting others. I bought a few coupon books to add for tonight’s prizes so the kids can choose a slurpee or frosty. Each Jr. Frosty voucher is valid through 01/31/16 giving recipients plenty of time to cash it in. Head over to your local Wendy’s to partake in this fabulous deal. Whether you give them out for Halloween or keep them for yourself. This is definitely a deal worth checking out! What do you think of this voucher idea? 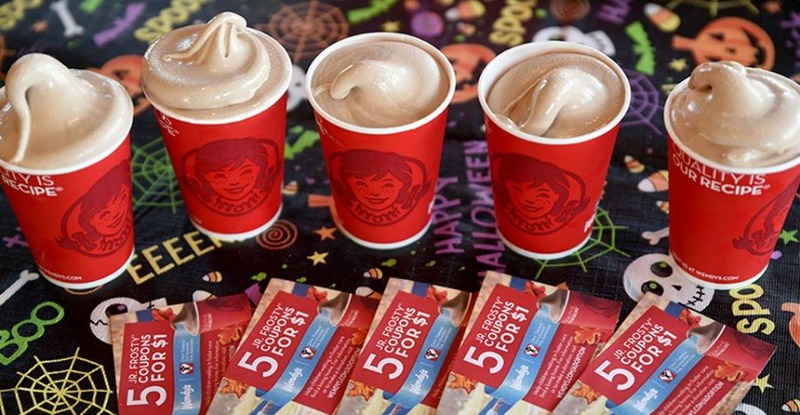 Would you make the switch from handing out candy to handing out frosty vouchers? Do you prefer the slurpee or frosty voucher idea better? Will you be giving out candy tonight? Years ago I used to buy and give out candy that I liked. Therefore, whatever candy was leftover I could enjoy. Then as I got older and was eating healthier I would buy candy I didn’t like so I didn’t have to worry about eating the extra candy and consuming all those junk calories. Whatever candy was leftover I would throw out or take to work and leave it in the break room. As a parent, worrying about what candies your kids are getting and eating from strangers on Halloween is a real concern. Finally there is a new option! 7-Eleven is selling coupon packets for small slurpees. 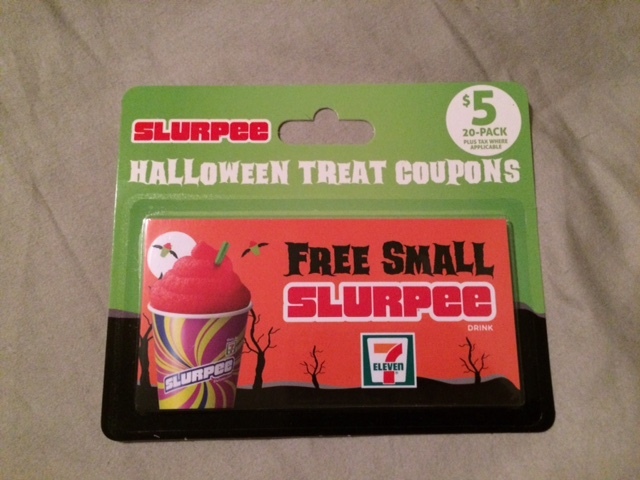 For only $5.00 you can purchase a coupon book that contains 20 free small slurpee vouchers. I bought a few packets to give out to trick-or-treaters on Halloween instead of candy. In addition, I sent some vouchers out in Halloween cards and passed some out to friends and coworkers. These vouchers are truly genius! Not only will parents be thrilled their kid isn’t receiving another piece of candy; the kids will love it because they have another treat to look forward to. Also, there won't be any extra candy leftover to tempt me from misbehaving on my diet. These vouches are sure to be a hit! 7-Eleven, Inc. is the world’s largest convenience store chain operating, franchising, and licensing more than 56,600 stores in 18 countries. With so many locations you won’t need to worry about the recipient finding a 7-Eleven to redeem their voucher. Each slurpee voucher is valid through 12/31/15 giving recipients plenty of time to cash it in. What do you think of this voucher idea? 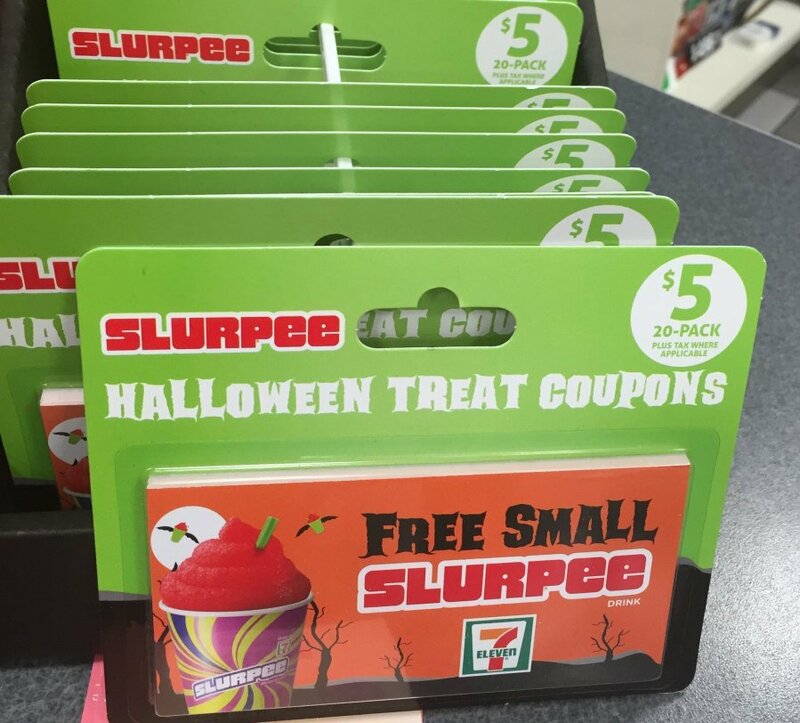 Would you make the switch from handing out candy to handing out slurpee vouchers? This is so crazy! I was in The Dalles and had been visiting my step-grandfather at the Oregon Veteran’s Home that day. My grams and I stopped by for lunch earlier. Normally we visit at dinner time, but that day we had other dinner plans so we went at lunch time instead. Otherwise we might have been there during the attack and when OVH went on lockdown. The Dalles is this small, cute town on the Columbia Gorge. So small, the few street lights they have blink yellow all day on Sunday’s lol. This is normally a sweet, quiet town, where almost everyone knows each other. This is so shocking and devastating! Unfortunately, we didn't know this couple as they are originally from Happy Valley and the husband resided in D Wing, which is the Dementia Wing. OVH isn't huge, but most residents stay in their wing of the hospital, although they do have free range of the facility. I used to work at OVH and I am so stunned that this would happen there. Very sad story! And as far as I know, the motive still hasn't been determined. PORTLAND — An Oregon woman fatally stabbed her husband during a visit to the veterans’ home where he had been living, the authorities said. Esther Wilkerson, 70, of Happy Valley, made an initial court appearance Monday on charges of murder and unlawful use of a weapon. Her husband, 67-year-old James Wilkerson, was killed Sunday at the Oregon Veterans’ Home in The Dalles, where patients receive 24-hour, long-term skilled nursing and rehabilitative care. The 4-foot-9, 80-pound defendant was being held without bail at the Northern Oregon Regional Corrections Facility in The Dalles. Her next court appearance is scheduled for Oct. 26. The lawyer assigned to represent her, Jack Morris, is out of the office until Wednesday and could not be reached for comment. Police Chief Jay Waterbury said the Wilkersons had been married for 40 years and investigators were still trying to determine a motive. Workers at the home called police at 4:10 p.m., Waterbury said. The victim lived in a double room; the other half was unoccupied at the time. Police recovered a fillet knife that Waterbury described as having a roughly 6-inch blade. James Wilkerson served more than 20 years in the Navy and was a veteran of the Vietnam War. He had lived at the home for nearly two years, the chief said. Happy Halloween lovelies! 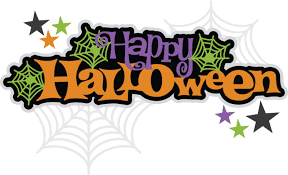 Hope you all have a fun and safe night! How will you be celebrating Halloween? Are you taking your kids trick-or-treating? Are you going to a Haunted House? Will you be dressing up? Hey lovelies! So this month has been a very difficult month for my family and me. This is quite sad, because October is one of my favorite months. First I was sick, then my mom had another surgery, then my step-grandfather was sick, then my grams had surgery. So this month has basically just been a month of sickness and healing. Since I am a certified caregiver I helped out with both surgery recoveries. After taking care of my mom here locally, I went up to The Dalles (3 hours away) to take care of my grandparents. It was nice seeing them and being back “home” – I spent my sophomore/junior year of high school there and worked there during my last year of college. So I have lots of love for this cute, small town. However, I am happy to be back to my current home and sleep in my own bed. Plus, I wasn’t able to take my girls with me, so I had to leave them with my mom. She took great care of them, but I really missed them. Dolce and I have never been apart more than one full day, so it was extremely hard to leave her. Unlike Adrina, she didn’t know I would come back to her. I know this is something she needs to learn, but it is difficult to put her through it. As soon as I returned home she would not let me out of her sight. Thankfully neither of my girls were upset that I had left and clung to me to make up for all the lost time. In addition, my family is finally doing much better. My mom’s surgery was cancer related, but she is feeling better and is back to work now. This was her 6th surgery! Thankfully she is being a better patient now and actually listens to me. Unlike my grams, who is a nurse, and I basically had to duct tape her to the chair for her to sit down and rest. She had rotator cuff surgery, making her my 5th patient I’ve taken care of with this surgery. My grams has always been one to not let a little pain keep her down, but this surgery is extremely painful and I think she was quite surprised to find that out. I had a great time with my grams and I was happy to be able to help and take care of her. My mom and grams took care of me when I was little and sick, so it’s nice to be able to pay back the favor and take care of them. I apologize and thank you all for your kind words and understanding. 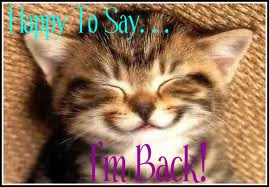 I am ecstatic to be officially back and post on a more regular basis. 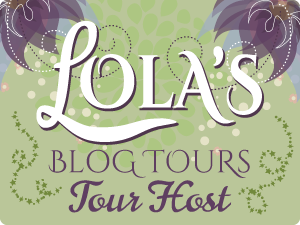 I will be teaming up with some more awesome bloggers for exciting, new giveaways. 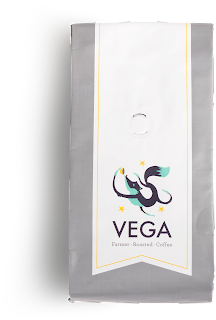 Also, I will be working on some product reviews and introducing you to my favorite new items. $120 Jord Gift Certificate Giveaway - Enter daily! Hi lovelies! Come check out this exciting new giveaway that I am participating in! One winner will win a $120 gift certificate to Jord! Jord is known for making beautiful and luxurious wood watches for men and women. Also, be sure to enter daily for more chances to win! Good luck! $250 Coach Handbag Giveaway - Enter daily! Hey lovelies! Come check out this beyond fabulous giveaway that I am participating in for a chance to win a $250 Coach Handbag! This purse is gorgeous and will totally be on your must-have list for fall. Remember to enter daily for more chances to win! Good luck! Would you keep this or would you gift it to someone? 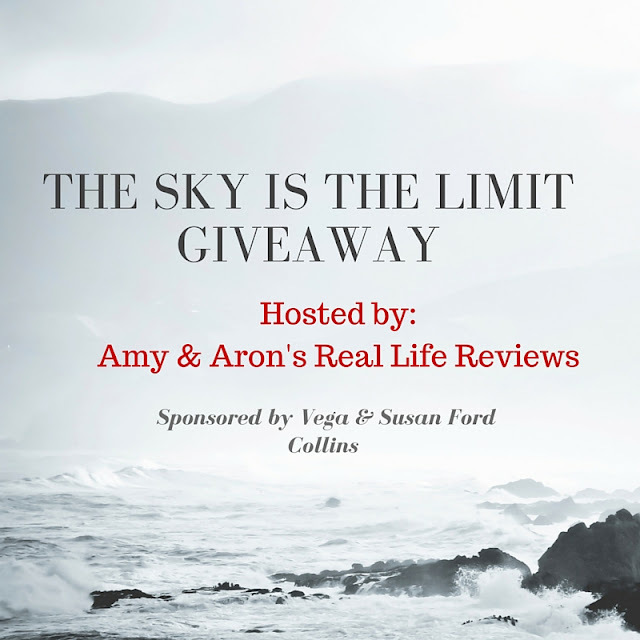 The Sky is the Limit Giveaway - Enter daily! Hey lovelies! Come check out this fabulous new giveaway that I am participating in! There will be 2 lucky winners so be sure to enter daily for more chances to win! Good luck! This is a great package perfect for anyone! Now for the fun stuff. This giveaway is open to US. 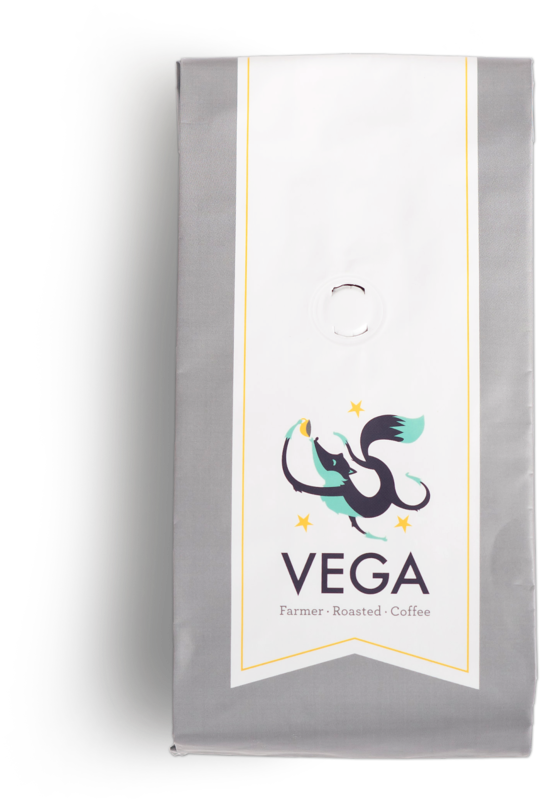 There are daily bonus entries for sharing this giveaway on your social media channels. I can't ask you to "Like" our pages but, if you see something you like, let us know so we can bring you more of it. We LOVE it when you LIKE our pages. Hey lovelies! Hope you are all having a fabulous weekend! Sorry I’ve been MIA for the last few days. I chipped two of my front side teeth on stupid licorice! Grrrrr Red Vines! Lol. 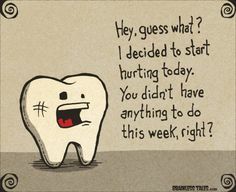 Unfortunately, it caused more pain than I expected and had to have emergency dental work done. 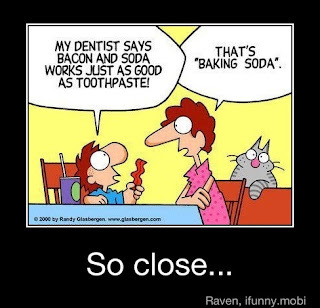 If you know me, you know that I have always been scared of dentists. So I had to take Ativan to calm down and that plus the pain meds and numbing meds I basically slept for two days straight. Then yesterday, I thought I was back to normal, went out running errands, and grabbed lunch at one of my fav spots, Chipotle. Sadly I can only eat soft foods at this time, so had to have a boring quesadilla, not my normal crunchy fav item. I got home, started eating it and fell asleep on the couch around noon. I didn’t wake up until 1am!! Wow, my sleep schedule is all over the place. Thankfully, I was able to go back to sleep in my bed and when I woke up this morning, I actually felt refreshed and fully awake. Hopefully, today I will be able to totally stay awake and get back to a normal schedule. Thank you everyone for your understanding and kind thoughts. I have lots of posts on product reviews and giveaways and will have them up over this weekend. 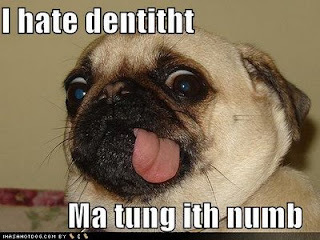 Also, this new dentist I saw was very kind, gentle, and understanding of my dental fears. He and his staff made my experience comfortable and I will definitely be back for additional dental work. I have future appointments already set and will be working on an office review. So if you are in the Greater Salem/Portland area I might have a new dental office recommendation for you!